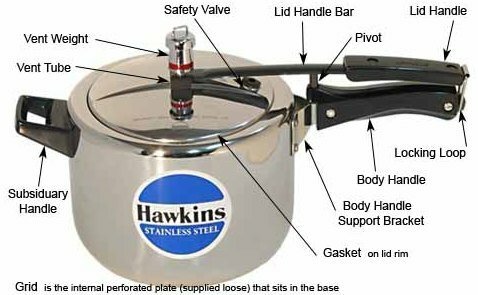 The Pressure Cooker Shop are currently selling the sought after Hawkins 10 Liter Stainless Steel Cooker for a slashed price. Don't pass it over - buy the Hawkins 10 Liter Stainless Steel Cooker here today! Made from commercially pure, stainless steel. Mirror polished, interior and base matt finish. Inside fitting lid opens only when pressure falls; the safety valve is located under the lid handle bar so that when it operates, the steam is safely deflected downwards. Stay cool handles. Features a 'goof-proof' lid that seals from the inside like a jetliner door, ensuring greater safety. Pressure is regulated automatically to optimum levels for speed cooking This awesome cooker is great for quick side dishes, apartment living, camping, motor homes, and backpacking!